If you or someone you know would like to share a story about your experience at Healing Reins and/or what our programs mean to you, please email ditak(at)healingreins(dot)org. We’d love to include your thoughts! as a physical therapy treatment tool really works! I would like to take this opportunity and thank not only those who generously donate to this incredible program, but also the entire staff who make Healing Reins the safe, comfortable, supportive haven that it is. I’m slowly gaining strength and getting my spirit back, My broken wings are finally beginning to mend. I feel at peace here and in my element. You have all been nothing but kind, patient and understanding. I never thought I would be able to ride again let alone have the physical or mental strength to keep coming back. You all and Traveler have given that gift back to me. I’ve grown so attached to Traveler, I believe he’s bringing me out of my shell and I have Healing Reins to thank for that. Your program is nothing short of amazing! it’s such an honor and privilege to be apart of it. Thanks to Traveler and the staff from the bottom of my heart. You’re all such a huge part of this journey I’m on to heal my mind body and soul. We work with Healing Reins because they help individuals on their journey of recovery. Healing Reins offers a unique clinical experience that connects with teens in ways that more traditional therapies alone often don’t. When individuals form a special relationship with their horse, we see the results in personal growth and improved outcomes. These relationships help foster skills in the areas of boundaries, communication, self-awareness, empathy, and self-control. 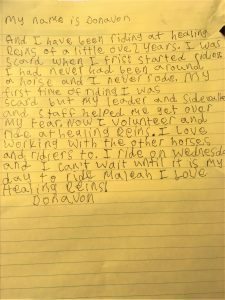 We regularly hear from the youth we serve that Healing Reins is a meaningful part of their treatment. Healing Reins plays an important role in our program and we are proud to partner with them. Initially, as a person with limited horse experience, I was concerned about how much I could contribute as a volunteer. However, I quickly discovered that Healing Reins would provide me with on-going training, feedback and support, which has enabled me to feel confident and truly enjoy my volunteering experience. My name is Donavon and I have been riding at Healing Reins a little over 2 years. I was scared when I first started riding. I had never been around a horse and I never rode. My first time of riding I was scared but my Leader and Sidewalker and Staff helped me get over my fear. Now I volunteer and ride at Healing Reins. I love working with the other horses and riders too. I ride on Wednesday and I can’t wait until it is my day to ride Maleah. I love Healing Reins! I came to Healing Reins for a horse fix and I’ve been volunteering for almost 8 months – I’m hooked. The horses are great, so gentle, affectionate and well trained. The instructors and other volunteers are great too, such kind, caring, helpful people. But, the biggest surprise for me is how good I feel watching people in various classes bond with the horses, learn new skills and improve physically, depending on what their needs are. One young man could barely walk and now he can walk, groom, tack and ride his Healing Reins horse. How cool is that? I could tell other stories but my most important message is to take a trip out to Healing Reins to see what they do and think about volunteering, no horse experience required! You will take away so much more than you can possibly give. What is Healing Reins? It is where miracles happen. Not big miracles but significant ones reflected in changes in behavior, attitude and ability of our riders. It is very satisfying to see a troubled youth connect in a very real and special way with our horses. We get to witness the sense of accomplishment in an “otherly abled” child or adult as they develop improved balance and strength that comes from feeling the movement of these amazing animals. Do we love the horses? You bet we do! Do we love the participants? You bet we do!! Would you benefit as a volunteer at this amazing facility? Absolutely! Working at Healing Reins Therapeutic Riding Center (HRTRC) as an equine-facilitated psychotherapist has been absolutely wonderful. I have seen many client go through great changes because of the support they receive from their equine friends. Gaining confidence, learning empathy, calming anxiety, and experiencing joy are just a few of the skills I see develop in my clients on a daily bases. Equine-facilitated psychotherapy is a powerful mental health modality, and I feel blessed to be a part of it with the HRTRC staff and community. Each day I remind myself to look for “the little things.” Doing small things with great love can bring change. And at the end of the day, those little things really add up. Healing Reins provides a unique outlet for people to work together. And healing happens with our amazing horses and instructors. Every day. For all of us. There are many ways to be involved, and always something new to learn as well as inspiring people to meet. As a volunteer, I give and I receive. I may leave a little tired and smelly, but I am a better person because of Healing Reins. How Can I Help Change Lives?